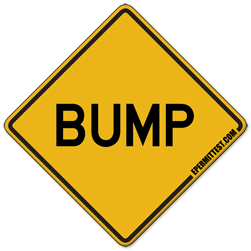 The traffic sign warns you that there is a bump up ahead on the road. Reduce speed and make sure to have both hands on the steering wheel as you approach the bump to avoid losing control of the vehicle. You should react in the same way when you see a DIP sign.